Suitable for complete beginners to accomplished bridge players. Learn Bridge with Andrew Robson, shows Andrew presenting a 32-part video bridge course across two DVDs. Using Andrew’s experience from a 25 year career as championship bridge player and teacher, this course will provide viewers with a compelling educational arc from complete beginner to accomplished bridge player. The first section (‘Getting Started’) will provide the basic educational tools from which to discover the game. Thereafter, the viewer will be given a step-by-step guide to the key skills of the game. 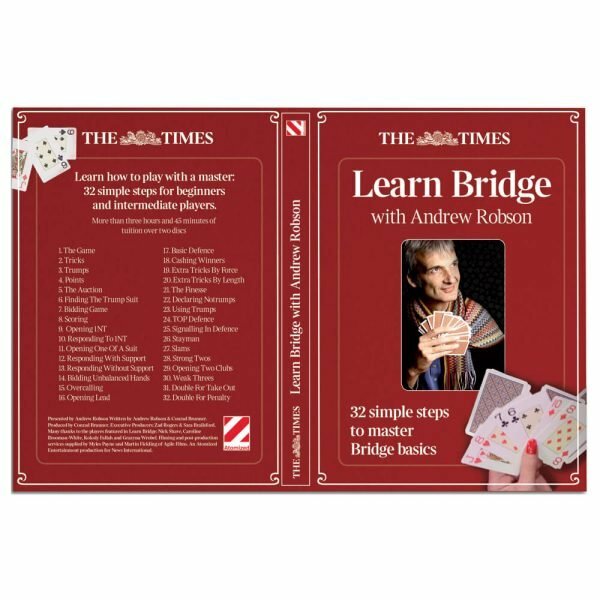 As well as Andrew’s engaging presence as guide and teacher, Learn Bridge includes advanced visual graphics, animated Bridge content and live bridge play to entertain the viewer on their path of discovery through the world’s most popular card game.